We had a great dinner. 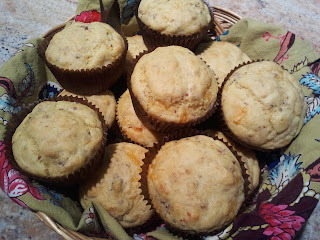 I made a home-made New England Fish Chowder and really yummy Bacon-Cheddar Corn Muffins. It was a perfect Autumn meal. I normally don't make muffins like this. Somehow adding bacon and cheddar seems very decadent. I get scared I am adding too many calories. But with this recipe one muffin is just 142 calories! No harm in this kind of decadence! The Bacon-Cheddar Corn Muffins were a perfect match for the chowder. Both hardy. Definitely a dinner that is warm and cozy. We all felt comforted and satisfied at the end of the meal. A big hit and a definite repeat.